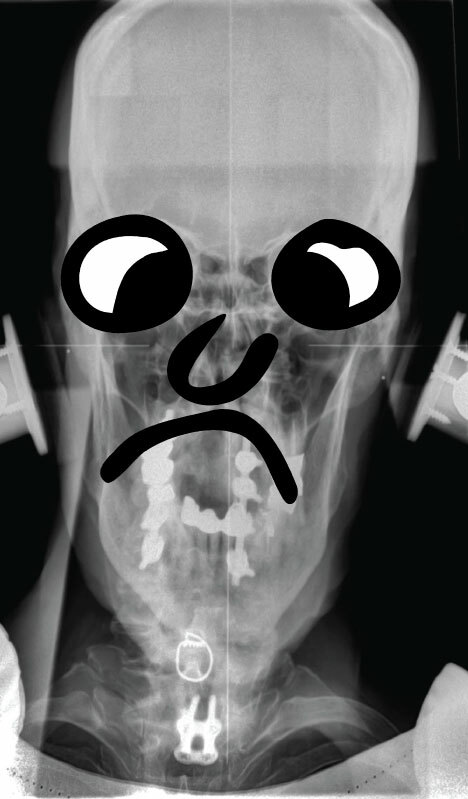 It's frustrating when you don't hold your alignment well after an upper cervical correction. Especially when your quality of life while maintaining that alignment is substantially better than when not. If the reason for instability is due to a correction that's not as complete as it could be, then at least you have something that can be improved upon. But sometimes you've got a great correction that should hold well, but for some reason it just doesn't. You're careful with your sleep position, work positions, you stop sparring with Chuck Norris on Friday nights, but nothing seems to help, and you're having to get adjusted more frequently than you should. I've heard a lot of theories (and excuses) for why this happens, and I'm sure that some of them are legitimate. I'm equally certain that it's a very individual thing and no one remedy will apply to a broad range of people. Here I'll add to that list of theories with something that I haven't heard brought up specifically, and which I plan to test with a sample size of one. A patient who started care in the middle of 2015 with some pretty severe spinal problems. Severe degeneration in the neck, to the point that a couple of segments had fused completely; 4/5 lumbar discs severely bulging; days at a time where legs didn't work and just had to stay bedridden; loss of bladder control; and more! "This person should be consulting with a surgeon! ", you might exclaim. Yes, yes--been there, done that. They are not interested in surgery, and trust me, you are not going to convince them otherwise. Turns out that we're dealing with an out of pattern type II with a plane line higher than Tommy Chong, and an angular rotation of 6.5° with a laterality of 2.5°. Happily, the initial correction went really well for (what I consider to be, at least) a pretty intimidating misalignment. Next visit should be a miracle recovery right? Wrong. There was a very interesting reaction after the first few corrections. I'm hesitant to exclaim "retracing!" after every little thing that happens after a correction because it seems like the term is very often abused or used as an excuse. But this was clearly a case of retracing that involved a previous (and initially unreported) brain stem stroke that had occurred about 7 years prior. Following the initial period of neurological equilibration, and continuing up to the present, things have gone very well for this individual. No more days without the use of lower extremities, no more loss of bladder control, 80%+ improvement in all areas of pain--a very successful case in my estimation. The strange thing is the stability of the correction. During the summer months, it will hold for a month max - maybe not even a month - before needing to be adjusted again. But during the colder, winter months, it will hold for 3-4 months at a time. What's the difference? According to this individual, a heating pad is used on the neck during the winter months, and this allows the neck to "self-adjust" during the night. Apparently this self-adjusting phenomenon is recognizable when it happens. And apparently it is due to the heating pad because during the summer months (when it is too warm to use the heating pad), this does not occur. Initially I was skeptical that this "self-adjusting" was really something that was happening, but it became clear that it lined up with how well the correction was holding. The pattern has repeated itself again this year, so I'm left wondering what exactly is going on, and how to re-create this scenario during the summer months. 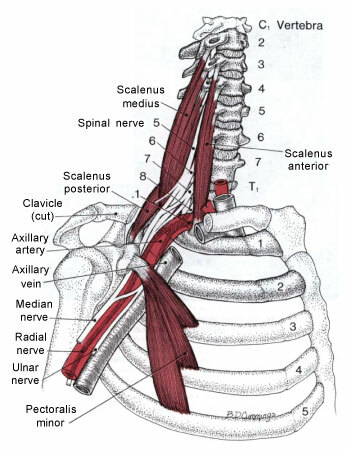 By chance I was reading through the "Scalene Muscles" chapter in the Travell & Simons trigger point text, and one of the points they bring up under the "corrective actions" section is that "Chilling the body, especially when resting, reduces peripheral blood flow and can lead to increased skeletal muscle irritability." They suggest using an electric blanket in bed or wearing a high-necked sweater or scarf in bed. Also suggested is the application of a moist heating pad over the scalenes for 10-15 minutes before going to sleep at night. The possibility seems likely that this might be the mechanism behind this individual's pattern of holding. Another suggestion made by Travell and Simons is the elevation of the head of the bed by 3-3.5 inches in order to prevent the chest from riding up around the neck at night. The elevation creates a mildly steady traction on the scalene muscles that also allows for adequate venous drainage and lymph flow. They also remark that scalene dysfunction usually can not be permanently extinguished without this elevation of the head of the bed. I'm optimistic about this being a solution to this particular holding problem. We haven't had a conversation about it yet, so I don't know if this person will be willing to forgo the heating pad during the rest of this winter in order to test out the bed elevation theory, but at the very least, once summer rolls around we'll give it a shot and see if this might be a solution to the problem. I will report back on the success or failure of the experiment. From my own observation, trigger points in the scalene muscles are fairly common. This is one more thing to keep in mind when trying to figure out why the person who should be holding their alignment, isn't.